280-300 g of water approx. Dissolve the yeast in 100 g of warm water. Place the flour on a large pastry board in a mound with a well in the middle and pour the dissolved yeast into the well. Complete by adding the oil. Mix, adding more water as needed to create a firm, stretchy dough and add salt to taste. Knead for a long time, form into a ball, place in a bowl, cover with kitchen film, then prick holes in the film with a toothpick. Leave the dough to rise for 20/30 minutes. Knead again, then use a rolling-pin to roll out small portions of the dough until 3 mm thick. Cut into triangles and fry in hot oil in a frying-pan on a triple ring burner. 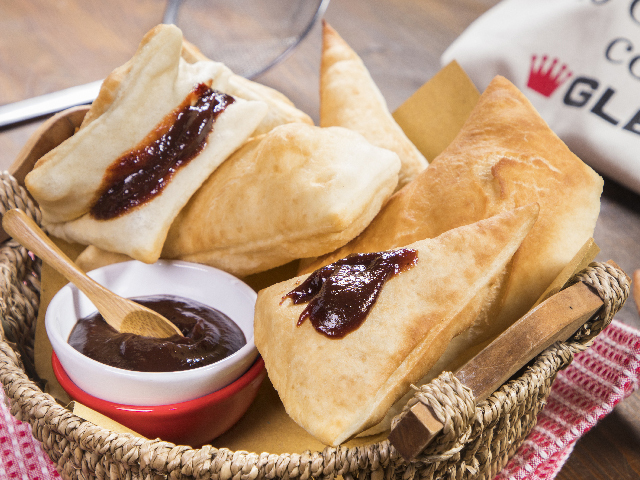 Remove from the oil with a slotted spoon when puffed and golden and serve the "gnocco fritto" with the savòr fruit preserve.